What Lessons Will Pepsi Learn About Crowdsourcing for Social Good from Chase Bank Contest Fail? Pepsi is taking a bold move. It's not spending money on Super Bowl ads for Pepsi beverages. Instead, Pepsi is using the money for lethal generosity through its Pepsi Refresh Project, a crowdsourced cause marketing effort to give away $20 million in grants to help revamp communities. Rather than donating the money to nonprofits through a traditional corporate responsibility grant program, Pepsi will jump on the online contest bandwagon. Pepsi will invite "applicants" to submit big ideas to change the world and then ask a crowd of Pepsi Fans to vote on them. Pepsi will have contests every month for 10 months beginning Jan. 13. Notice: Pepsi will send a one-time reminder about the Pepsi "Refresh Project" to the email address you provide. It will not be collected or used by Pepsi-Cola Company for any marketing purposes. Let's hope they learn from the recent Chase Bank's Online Contest Fail, other studies on these crowdsourcing contests, and countless examples of crowding sourcing for social change. I hope they avoid going to the dark side and waste money on projects and processes that don't have impact as well as many nonprofits' most valuable resource: their time. The Chase Community Giving contest on Facebook is one of the biggest online contests before Pepsi announced their contest, open to more than 500,000 charities. As of this writing, 1,027,398 people joined Chase’s fan page to cast votes for their favorite charities. The top 100 "eligible" vote getters, announced a few days ago, received $25,000. They are going to participate in the next round, "The Big Idea" where the 100 charities share their big idea for changing the world and get votes. The winner gets $1 million and five finalists will receive $100,000. What can Pepsi learn so its contest can truly make a difference in local communities, help them sell more soda, and avoid having its brand get tarnished? 1. Open or Closed Set of Participants: Contest sponsors need to decide ahead of time how open to be in terms of who can participate. It's more than the basic eligibility requirements -- nonprofit versus individual or for-profit or particular interest areas or even the legal language. With some contests, the contest sponsor vets a list of participants before letting the crowd vote. This is how Target ran its contest and more recently PayPal's FruitCake Challenge. This way, the contest sponsor's dollars are donated to a known set of organizations that have been selected based on corporate values, goals, or philanthropic strategy. There's a cost here - the cost of not getting the absolute best idea because the person who thought it up wasn't eligible to participate. But there are some things to think about with a completely open contest, one where anyone one submit an idea and the crowd votes on the best idea and the one with the most votes wins. The sponsor needs to ask if they are truly committed to the idea that gets the most votes, no matter who suggests it? With the recent Chase Online Giving Contest, there were last stage disqualifications. And although they had a disclaimer in the contest official rules "... or organizations otherwise not in alignment with Sponsor's corporate social responsibility guidelines. Any organization determined to be ineligible at any time will be disqualified. 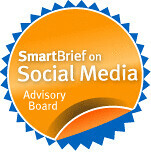 Sponsor retains the right at its sole discretion to determine eligibility and reserves the right to disqualify any Charity for any reason whatsoever" this disqualification made them, as Nathaniel Whittemore said, look like jerks - not to mention inspiring a chasesucks hashtag and causing some negative reactions. 2. Leader board or Open Voting Records: The big mistake that the Chase Online Giving Contest made was not providing a leader board, that tracked participants progress. Leader boards and dynamic vote counts help make a contestant's job of getting out the vote easier. With the Chase Bank Online Contest, the lack of a leader board created a lot of extra work for the nonprofits. They had to spend time combing through pages of other organization's voting records. Also, it doesn't make for a clear call to action message. A leader board can also keeps the sponsor honest. It appears that Pepsi is partnering with some folks who have some experience so this may not be a popularity contest. 4. A Balance of Social Good and Marketing: Is Pepsi really committed to solving social problems in its communities or does it think that redirecting its SuperBowl advertising budget and using social media to promote its generosity can sell more soda? We know that corporate greed is being replaced by generosity and we know there is potential synergy between financial performance and attention to community and social needs. I'd love to see a theory of change for this contest. Perhaps it exists. 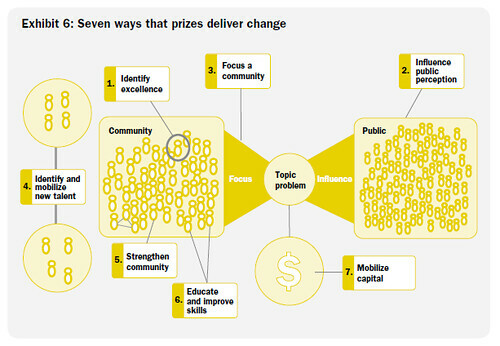 The above diagram describes the theory of change for Prizes from a recent report by McKinsey I hope that Pepsi will be transparent in sharing that if it has one. Do these contests really have impact? Do they really help nonprofits or distract from their work? Or is this just marketing? I predict 2010 will bring an end to these meaningless voting contests. Voter fatigue has begun to set in. I can't stand getting another email asking me to vote for this or not. And I'm not alone. Voting has a place in some contests - i.e. American Idol - but not in most. My New Year's resolution is not to participate in any more of these silly contests. Hi, Beth -- I think that we, as a field, should really start refusing to be part of these silly and meaningless contests. They are popularity contests about who can muster friends and family to cast a rather meaningless vote, and they say nothing about impact or value of the mission and work of any given organization. How about a contest that measures actual impact of work by some good, well-thought out metrics instead of yet another time-waster that measures how many votes you can garner with incessant tweeting and bombarding your mailing list with email appeals? It's time for this field to rebel against what is starting to amount as PR manipulation, and focus on impact, rewarding great work, and reforming this increasingly broken sector to refocus on what actually matters. Your naive to think that this contest will solve social ills; this is more about moving some money off the books to avoid a huge tax payout or to improve Pepsi's image with some 'positive PR'. The amounts of money involved might make a small difference to a small number of people, but that's it. If Pepsi really cared about any of this the directors buy back the company from shareholders and then throw the company's profits into fixing society's ills. I don't see that happening any time soon lol. I think point #3 is key (best) for any corporate sponsor or foundation wanting to use crowdsourcing. It's important not to make these popularity contests. Then, anyone with a deep mailing list can win some cash. I think a hybrid model - the public and a set of advisers - is the best way to go. Obviously Pepsi's mission isn't entirely altruistic. They'd like to use this campaign to sell soda -- and why shouldn't they? But you're absolutely right: it comes down to balance. As long as there's a genuine interest in helping these nonprofits (providing grants, support and not just wasting their time), I'd say the more revenue Pepsi can generate from this the better. It will only inspire other large corporations to follow this strategy, and put more energy and marketing dollars behind cause-driven, socially responsible campaigns. Online Charitable Contests REMASH: Dear Beth K.
This blog post is in response to the Chase Community Giving Contest controversy and the many blog posts and articles that have ensued. This post is an open-letter response to Beth Kanters blog post above. I think the comments to the post are as interesting as the post itself. Regardless of the fact that obviously Pepsi's mission isn't entirely altruistic, the larger point is that good ideas are getting visiblity, being given a venue for consideration, and an opportunity for other coporations & organizations to grap a hold of the idea and drive it further towards execution with more funds to make it a reality! If itt sells more product, that's a plus do, as it means more campaigns for social good will surface & thrive. Bottom Line: the whole point is that good, sustainable, life-changing, ideas will flourish, get vetted, and be funded and "change agents" and "influencers" can get in the game to make change happen! There are much more worse things that having more people buy & drink Pepsi!